At year’s end, some of many lists to ponder involve “best podcasts.” While they vary according to taste, what’s apparent is that podcasting still has a significant place in online life. Indeed, 2013 was the year that Apple announced one billionth podcast subscription had been logged on the iTunes store. 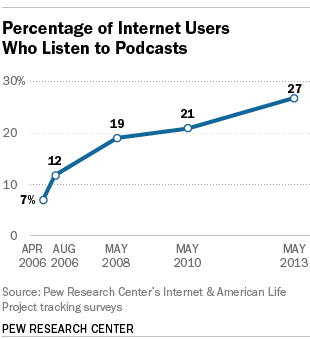 Pew Research Center polling shows that the podcast user base continues to expand. A May 2013 survey found 27% of internet users ages 18 and older download or listen to podcasts, up from 21% three years ago in May 2010 and 7% of internet users in 2006.